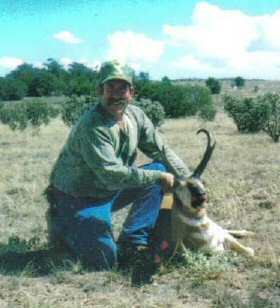 Our antelope hunts are conducted on private land in south-central New Mexico. 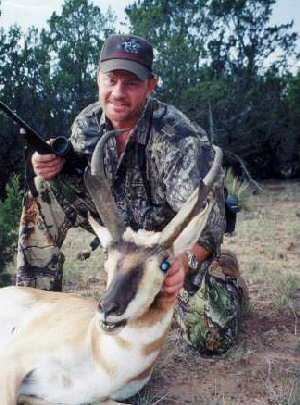 This is a trophy antelope hunt on 127,000 acres of private land. Success rates run very close to 100% on this hunt. Hunters can expect to see over a hundred antelope per day with some nice bucks in the 16 inch plus class; the opportunity to harvest a trophy buck is very high. In 2004, 8 B&C class bucks were taken out of 15 hunters. In 2005, 7 B&C class bucks were taken out of 18 hunters. In 2006, 3 B&C class bucks were taken out of 18 hunters. On-site taxidermist to care for cape and trophy. Transportation to and from ranch. COST FOR RIFLE HUNT: $2,750.00 per person plus tax. Deposit of $1,250.00 required to book this hunt.